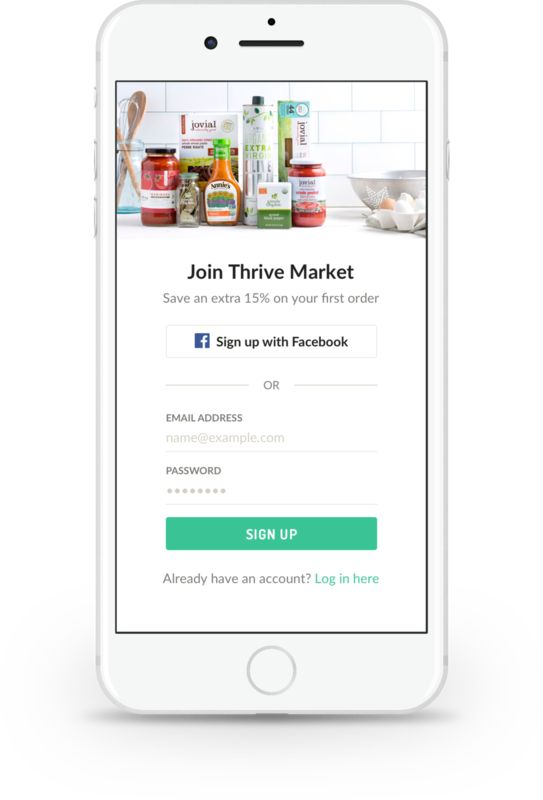 Thrive Market is an online, membership-based retailer of organic and natural products. From its humble beginnings as a food co-op, Thrive has experienced remarkable growth and stands today as the market leader in exclusively non-GMO products. The launch of our very first iOS and Android apps was a huge milestone, and they quickly became two of the most prominent, highly-rated apps in the food and grocery category. Our work was even recognized by Apple and Google, who both featured Thrive as a “Best App”. As Thrive's first product designer, I led the design of our apps and worked across the entire gamut of design, including UX, UI, animation, and visual assets. I often wore additional hats, including strategy, copywriting, and front-end development. Before jumping into design, I took some time to evaluate the landscape of mobile apps in the food and grocery space. In my research I observed how each app approached navigation, core UX flows, and presentation of content. I was particularly interested in the treatment of nutrition and ingredient information, which was of paramount importance to Thrive customers. I also sought to understand who our customers were, and the mindset and motivations behind their shopping behavior. In addition to speaking with customers directly, I leaned heavily on the Customer Research Team who had amassed a rich set of qualitative insights from conducting interviews, panels, and surveys with customers. With a very short timeline to bring our apps to market, our development efforts proceeded at breakneck speed. As a designer, this meant working hand-in-hand with the engineers, oftentimes talking through designs in lieu of comps and specs. This working relationship eventually led to the creation of our Design System, which helped me drive consistency and coherency without having to mock up every screen and state. This also freed me up to address more important design problems, as well as tackle UI refinements directly in code. Screen by screen, the experience came together and we successfully launched the Thrive Market apps. Our iPhone and Android customers now had a dedicated mobile solution for shopping their favorite organic and natural products. With the foundation of the app established, we moved ahead with building new features and functionality off our roadmap. Some of the bigger initiatives included a referral rewards program, in-app product reviews, and a recurring order feature. Of course, we also continued to make refinements and enhancements to the core experience. To help us identify areas of improvement, we kept a close pulse on our app store reviews, customer feedback, and insights from our analytics. The product culture at Thrive was highly data-centric, and everyone on the team was encouraged to contribute ideas for A/B testing. One of the first experiments I spearheaded involved enhancements to our search experience. In the original experience, the app autosuggested product names as a user typed their search query. However, I had observed in our analytics that the majority of the time users searched for product categories, not individual products. At Thrive, every SKU in our catalog was tagged with category terms used for product classification. I reasoned that surfacing these category terms to users could yield much more relevant, comprehensive search results. We evaluated this idea with a split-test of the autosuggest feature — the control cohort would see individual products, while the experimental cohort would see product categories. 1. Category autosuggest was used 5 times more frequently than the original autosuggest. Our interpretation here is that product categories were more aligned with actual searching behavior, thus accounting for greater usage. 2. Average order value was 14% higher, signifying a larger cart size at checkout. This we attributed to an improved findability/discoverability of products, thereby increasing the propensity to add products to the cart. In following, we rolled out category autosuggest to all users, and brought it over to web as well. In other A/B tests, we oftentimes saw significant improvements from design and copy changes alone. A good example of this was the refresh of our push notification prompt. The push notification prompt serves to prime new iOS users to enable push notifications. With our original prompt, the push notification opt-in rate was significantly lower than the ecommerce industry average of 40%. Improving the opt-in rate was important because we relied on notifications for reengaging users and keeping them informed about their order status. We tested an new version of the prompt that had a refined visual design, updated messaging, and some delightful animation touches. The new prompt led to an 64% lift in opt-in rate and pushed us above the industry average — an incredible achievement from relatively small and easy-to-make changes. One of the most exciting moments for us at Thrive was being recognized by both Apple and Google for the quality and design of our apps. In the Apple App Store, Thrive Market was selected as a Best New App and prominently featured on the main landing page. Likewise, Thrive was awarded the distinctive honor of Best Apps of 2016 in the Google Play Store, alongside other premier apps such as Reddit, Uber Eats, and DoorDash. For me, an even greater achievement are the thousands of happy customers using the Thrive Market apps. User feedback has been tremendously positive, with 5-star averages across both stores with over 10,000 ratings. Honestly, this is the best online shopping app I've ever used. Super easy, works well, and even uses Apple Pay so I didn't have to run and get my credit card. Great job! I love this app and the savings and selections of the natural food buys are amazing! It really pays to be a member. I love thrive market and this app makes grocery shopping so easy. Everything other than produce with two day shipping! Products that I trust. My time at Thrive Market marked my first experience building an app from the ground-up and taking ownership across all aspects of design. The journey was a substantial driver of professional and personal growth for me, and I'm incredibly proud of what my team accomplished. I look forward to seeing how Thrive Market and the mobile apps continue to flourish and evolve.